2019 is just around the corner and we begin the new year in the best way we know. The first issue of the year brings with it information about 52 new cars and two-wheelers that you can expect to see in 2019, through the Cars for 2019 and Bikes for 2019 features. This covers all the excitement for the next 365 days, but what about celebrating the year that was? We test 13 cars and two-wheelers to close the year. We preview the upcoming 2019 CNBC-TV18 OVERDRIVE Awards as well, in this issue, while also announcing the Indian Car of the Year (ICOTY) and the Indian Motorcycle of the Year (IMOTY). In the four-wheels section, the big tickets are the Tata Harrier and the Nissan Kicks, first drives of both can be found in the January 2019 issue. These upcoming SUVs will play key role for their respective manufacturer as well as for the SUV segment as a whole. We also drive the Audi e-Tron as well as the new Mercedes-Benz GLE. Then there are the 2019 BMW 3 Series, the Kia Ceed, and 2019 Bentley Continental GT, which we have also driven. Meanwhile, there is plenty of retro-themed action in the two wheels section. We ride the Jawa Jawa and Jawa Forty-Two from the reborn brand, as well as the 2019 Triumph Street Twin, and the 2019 Triumph Street Scrambler. To round it up, we compare the challenge of the Suzuki V-Strom 650 XT against the established adventure tourer from Kawasaki, the Versys 650. Over in motorsport, you can read the MotoGP Season roundup, as well as coverage from the INRC Rally of Chikmagalur, 2019 JK NRC finale, as well as the JK Hornbill Rally. That's not all. There is also an interview with Kia chief designer Gregory Guillaume, and a feature on the London-Sydney Rally, apart from industry news, launches and columns, as well as our regular features. 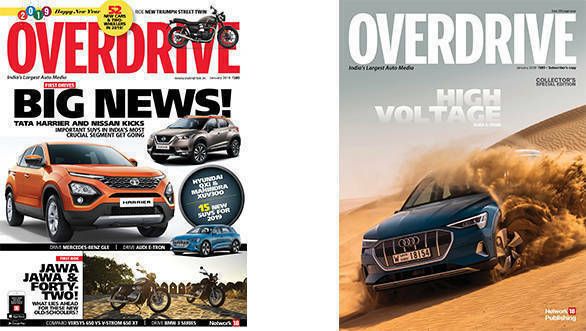 The January 2019 issue of OVERDRIVE is a packed one and if you want to immerse into the year ahead in automobiles, you must pick up your copy before they run out!